Crushes. Remember how confusing it was to figure out crushes? Maybe you had them and didn't know how to talk about it. Maybe your friends had them and suddenly could talk about nothing else. Maybe you had a crush that seemed like it was "wrong". Maybe you never had any crushes and wondered why everyone else seemed to. Ivy Aberdeen's Letter to the World by Ashley Herring Blake (Little, Brown, 2018) is a great book about first crushes and that unique ache that middle school love can bring. There's been a lot changing recently in Ivy's life: Ivy's mom had twin boys, Ivy's suddenly feeling a rift between her and her older sister, Ivy's feeling like she doesn't matter very much to her family. And there's this big thing that she can't tell anyone, not her mom, not her sister, not her best friend. Ivy's never had a crush, but when she imagines herself having a crush, she imagines it with a girl. She doesn't know any other girls or women who have relationships with other girls or women. She knows that girls her age are supposed to like boys. And... she doesn't. So she keeps it to herself, letting her art journal be her only outlet for her feelings. At the beginning of the book, a tornado descends upon her rural Georgia town and destroys Ivy's house. Her family escapes with their lives, but not much else. And suddenly Ivy's life is truly thrown into tumult. In the aftermath of the storm, June, a girl from Ivy's class, shows up with her doctor mom to help victims of the storm. And suddenly Ivy's imagined crush has a name. But what do you do about a crush that's such a big secret you can't tell ANYONE? And what do you do if you're not sure and if making a decision about who you like might change your life forever? Can I tell you that I am so glad that middle grade LGBTQ lit is blossoming? There have been a handful of great titles published over the past couple of years and I'm so excited to purchase it and put it on my library's shelves to reflect our diverse community. These books are so needed. As mentioned by this book's editor in a forward note in the galley, middle grade is when many kids start identifying their preferences with regards to relationships. As gatekeepers, we need to be certain that we're providing mirrors to all kinds of different experiences. And when it's a great, moving story with unforgettable characters, that's just all the more reason to put Ivy Aberdeen on our library shelves. Ivy's a great tween character, dealing with being stuck in the middle of her family and being stuck in that "tween" place - no longer a child, not yet an adult. She's thoughtful and sensitive and wants to help more than anything, but she's afraid that her family sees her as a bother, a burden when they have so much else going on. I love the use of the physical storm as a catalyst to the story that represents the emotional storm going on within Ivy's mind. And Ivy's pain and confusion is palpable as she tries to navigate after the storm, feeling unsure not only about her place in her family (the unwanted middle child), but about her place in society. Readers who look for stories about the tween experience or stories about first crushes will find much to love in Ivy. There have been some great LGBTQ middle grade novels that have come out in the past couple of years. Readers looking for more lesbian or questioning characters should pick up P.S. I Miss You by Jen Petro-Roy and Star-Crossed by Barbara Dee. Readers who want additional realistic books that really GET how it feels to be a tween might enjoy P.S. Be Eleven by Rita Williams-Garcia. And readers looking for more middle grade books about exploring first crushes might like Shug by Jenny Han. 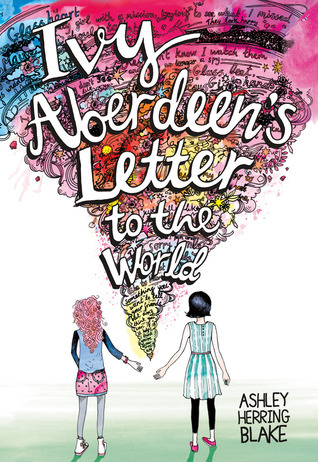 Ivy Aberdeen's Letter to the World by Ashley Herring Blake. Grades 5-8. Little, Brown, 2018. 320 pages. Reviewed from ARC snagged at ALA Midwinter.